I absolutely loved this exhibition. It was so funny, clever and cheeky. I have never laughed so much in an Art Gallery, possibly aided by the large glass of wine supped before entering. ‘MOTHERS’ – terrifying and awe inspiring. A survey of Martin Creed’s playful, thought-provoking art. Over the past two and a half decades British artist Martin Creed has pursued an extraordinary path by confounding the traditional categories of art. Winner of the 2001 Turner Prize, Creed is recognised around the world for his minimalistic approach that strips away the unnecessary, but preserves an abundance of wit, humour and surprise. Crossing all artistic media and including music, his art transforms everyday materials and actions into surprising meditations on existence and the invisible structures that shape our lives. This exhibition will be the first major survey of Martin Creed’s work, from its most minimal moments and extravagant room-sized installations. 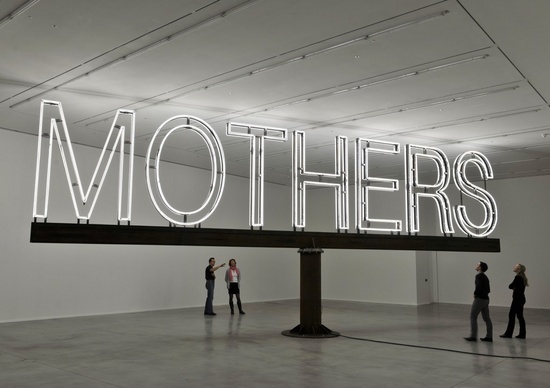 Martin Creed was born in Wakefield in 1968 and currently lives and works in London.